Jan. New Year's Eve hot cider open house at Glencrest (home!)J. 2nd yoga class added (Glencrest). Bed swap. Cold, gray, Lgrouchy, snowy. Curt and Garry found. Regular at Wok Inn Noodle. Feb. Gospel workshop!J Lord of Rings L. Others rip out carpet; I look for someone to install canister lights in yoga space (crawl in attic while winter). Mar. Judith Lasater yoga worshopJ. Laramie ProjectJ. Books, books, books; Easter at LEC. June Subdivision yard saleJ. Bear Valley paddle/camp in snowJ. Visitors sleep on porch and in yoga spaceJ! Mosquito net cazba established. Men's prayerJ. Jarbridge. RAV. July Heat melts stuff L; major summer hibernation. Blue bunny shakes J. Hot tub L.
Aug. Surprise heat reprieveJ! Blueberries missing. Camp w unitarians. Maclean's 1919. Finally watch Red Green Show. Armada meltdownL; Presario takes over... sortof. Ann Frank memorial dedicated in Boise! Sept. Buddhist raft trip. Illini rendezvous in ColoradoJ. Telescope out. Oct. Hot tub resumedJ. Still sleeping on porchJ. Silver City full moon. Nov. Home, home, home. Yoga, yoga, yoga. Framed Degas and Scholer prints. CC Chan meets Kathleen Norris. Presario berserkL; XP history. Ridgerunner. 2+ Thanksgivings. Dec. ShinglesL (both me and the house). Breitenbush. Nuala O'Faolain, Whale Island, Lobster Chronicles; Bremerton; BellinghamJ. January. Hurried back from Puget Sound wanderings to open home to neighbors New Year's Eve. Bit hard to hold smashing open house, blowing back into town at the last minute. Nevertheless several sets of neighbors wandered in and enjoyed meeting each other, which was what it was all about. Not quite like the good old days of big open houses at 1032 Pine Street, Boulder, but fun. Real winter-- snowy, cold, gray. Big Martin Luther King Sunday afternoon snowstorm reminded me of Colorado. Too daunting to step out to hot tub some nights! Grouchier and bluer earlier than ever, necessitating occasional forays to thirftshops. Treasures like a milkweed seed pod in Plexiglas provided solace. Highlights: finding/being found by more Illiini--Curt and Garry. Escaped by reading inspiring books about people who found themselves through spiritual practice (Aaya Khema, Reb Anderson, Crane's Bones of the Master). Relocated bed downstairs, trying out futon; sleep and back change for better. CC Chan's Wok Inn Noodle restaurant becomes my second home, satisfying hunger for fine oriental food and warm company. February. Highlight of Boise winter--gospel workshop mentioned at MLK concert (above). Spirit soared to sing with a hundred under the direction of visiting Bay area masters. Heard tell tv camera zeroed in on me during local news! If my feet hadn't hurt so much, I'd have thought I wasn't on the ground. "He is a mighty God... Forever and ever and ever…! Amen!!" Rosalie Sorrel's concert on behalf of families of prisoners awesome, because she's so awesome, even if posters were torn down. Boise! Although Joseph filled me in on it's background, I was too far out of the loop to appreciate Lord of the Rings. Barely made it to the end. At some point I gathered I was supposed to be doing homeowner inside home improvement projects, like painting and ripping out carpet. None of that for this new homeowner, who just bundled up, sulked at the computer in the warmer upstairs space, dreaming of the fall get together in Colorado, scanning photos, turning a blind eye to the nasty carpet and zillions of spackled holes. Incorporated Ecosque's Pain Free into yoga classes. March. Fine Judith Lasater yoga workshop in Boise, after years of teachers recommending her. Plays of the year: "Mahalia" (musical touring troop) and "Laramie Project" (local Spontaneous Productions). Both moving and awe inspiring. More reading than ever, introspection, wallowing. Discovered awesome Catholic writers Henri Nouwen and Ronald Rolheiser. In honor of Barb Smith, read her recommendations: Leopold's Ghost and Walking on the Land, both extremely painful exposés of inhumanity. No one, no culture or group has a corner on cruelty. Barb leaves such a legacy in my heart. Easter in Wilsonville OR; good visits recharging spirit in Seattle. April. "Spring", is all notes say. Guess that says it. May. Folklife in Seattle. Pat Wright's Total Experience Gospel Choir blew me away. Expected a big, loud choir. Wrong. What a woman/choir! She's my nominee for Emerald's City crown of jewels. Loved watching "Why Does the Cowboy Sing?" documentary with footage of Glenn Ohrlin, whom Prof. Archie Green brought to Illinois in the '60s. As always, deeply touched by the message of peace sung by many peace and community folk choirs. Sang along with Marli and her friends at every opportunity. Folklife, sigh. June. Home just in time to drag stuff onto the driveway for our Gary Lane Meadows yard sale, on one of the first wet days in months. A subdivision that yard sales together, works together. At minimum, a subdivision that yard sales means I only have to drag everything I've ever dreamed of down the street! Evie and Dave (who maintain my aging furnace/air conditioner) had the coat rack I've needed to hang hot tub robes on, silk plants for the upstairs porch… Great chance to meet neighbors on our one certain common ground: way too much stuff. The following week found me camping and paddling the kayak down Bear Creek, as heavy skies intermittently dropped light snow on spring flowers in 8000' Bear Valley and let shafts of sunlight through. Stunning. A few days later first Katy and Carl from Bellingham, then Evette from Grand Junction became more overnighters to Glencrest, as I call home. K&C set up camp on the back porch; Evette, chose the yoga space. Yeah visitors!--fine company plus help with home and garden. Thought for sure Boise would be an popular travel destination--ha! Shortly afterwards, strung mosquito net tent moved around since Illinois days (as in The '60s), as summer home on the back porch. Like crawling into a high class cazba every night, watching stars through netting. 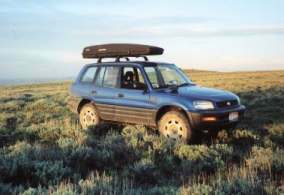 The last weekend of the month drove "new" toyota RAV south, across the bombing range, towards Jarbridge Wilderness in NV, after responded to an outing ad in The Boise Weekly. Hadn't been in such stunning, remote country for years. While the other 3 folks did serious hikes from dusk to dawn, I swung in the hammock, listening to bluebirds and nesting flickers. As we talked around a small sage fire as the full moon rose, realized absolutely nothing but names had changed in the environmental world. Ranchers still gate public land and government agencies still jump as high as leasees ask. Same old, same old. Grateful for Mike's recommending Idaho Loners. Somewhere in June, years of right jaw twinges blew into full force lightning; soberly but gratefully submitted to having my 1st molar pulled. This led to a summer series of far more painful, spendy, less satisfying maintenance appointments. However, the benefits of gentle, small female hands was duly noted and appreciated. Syringa Bank noon yoga class men introduced the Men's Prayer (and Red Green Show). July. Heat, heat, more heat and brainfog. Region compared dashboard melt downs (plastic communion glasses onto mine. Candles ran into pools). This summer--not coke, not ice tea, but blue bunny shakes (lime, reminiscent of Steak'n'Shake Columbus OH, and chocolate) soothed. August. Mercifully, heat back off early, evenings cooled! 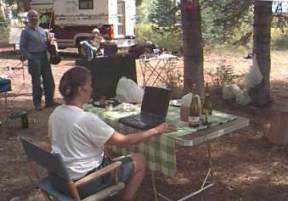 Gratefully joined neighboring UU family at annual campout at Ponderosa State Park in McCall, lovely new country for me. Returned to old favorite Sage Hen campsites to listen to hornets bounce off trusty REI dome tent (poles restrung this season) a couple weekends. No owls. Carcass that had grossed me out dispersed over the winter; one site now campable. No blueberries where I'd picked in last year; heard tell other areas had them. Zero berries for jeannie this year. Home one Saturday night, finally remembered to look for Red Green Show on closet tv (meaning lives in closet). Lo! the infamous Men's Prayer, recited earlier in summer! Right down my alley--Red Green--though I rarely remember tv. Still dependent Prairie Home Companion fan, however. Most delightful book of the year? Perhaps Norman Maclean's 1919: the ranger, the cook and a hole in the sky. What an awesome classic! Resumed qigong standing; super complement to helping realign hips with yoga. Sometime towards the end of August, may have used the car adapter with the laptop too much. At any rate, suddenly there was that familiar electrical smell and I knew the trusty Compaq was toast. Being in the heat of coordinating the Sept. Rendezvous online, addicted to instant email, dashed right out to Costco and found a fitness club and Costco member in the check out line. Brought home Presario with DVD and what I soon realized was the dread XP system. [Months later, the havoc reeked by XP while editing web pages still hasn't been straightened out fully. @$&*()!.] An idle ex-marine techy retrieved files from melted computer. Tense week. September. Although the mindful sangha raft trip early in the month was sublime (if nippy), the highlight of the month if not the decade, was gathering and camping with 10 Illini in the Flat Tops of Colorado at the world's first Simian Outing Society Rendezvous. We filled the 30+ year gaps with news and laughter, and enjoyed (brrr!) perhaps the world's first outdoor slide show at 10,000'. Fondly reported in frightening detail at SimianOutingSociety.org. May not get to official reunions, but instigated this one. Back home, resumed sleeping on back porch; set up old birdwatching scope for first time in decades, to observe early morning planets to east (can't see to west.) Peering at Jupiter and Saturn was like seeing more old friends. Garden produced bok choi, chard, leeks (planted to Evette) and hundreds of green tomatoes, until the yard froze hard. Maybe next year garden in on time? I pray (help welcome) the sprinkler system survives the winter; the saga is a subject so raw, I'd rather not go there--some detail on Glencrest webpage. To understate hugely, it's a huge relief to have summer and watering over. October. Still sleeping on porch a few more nights. Hot tub back on, love drifting off under stars. Last outing for the season: finally drove up to the old mining town of Silver City in the Owyhees, west of Boise. I've been slow to explore, and therefore, fall in love with Idaho. This totally unimproved mining town was love at first site, when I finally rounded the corner and saw it. Spent cold full moon night--moon broke through clouds--in BLM campsite near town. Gorgeous, gorgeous country. Strangely, weekend after weekend, a string of meditation teachers came through Boise this fall. Enjoyed seeing Leslie James (from Twin Falls) again who's lived with family in Tassajara for years. When it rains it pours… if only meditators in Idaho communicated with each other… dream on. Seems like "community" is a dirty word in Idaho. November. More staying home, home, home, snug in upstairs yoga space by new oil filled heater. I've got a reputation for "travel", but folks, that was BTH (Before The House). Now I stay home. Sure, can sub yoga on Saturday, whenever. Have hot tub to enjoy, running toilets to troubleshoot, leaking windows, sprinkler system to monitor, shrubs to prune, stuff to deal with. Married to house! Hiss...purr. The scope of Jeannie's home improvements is more like getting to the bottom of the round top trunk moved from Illinois. Revealed: beloved childhood blue and gray Degas silkscreen prints and Scholer (family) watercolors! Feels important to unpack life. Framing underway. Meditators Day of Dead potluck at hospitable Monasterios home. Took a pot of garden squash soup--again. "How do you remember what you brought last year! ", exclaimed one potlucker. "Dan's invitations are the social highlight of my year!" I explained [not to mention they're practically my only invitation to an Idaho home each year!] Listening to conversation about the impending election, personal challenge and illness, I practiced Buddhist non attachment. Can't wait for positive thinking to root in Idaho!! I suppressed shouting, "Mind your thoughts, fellow meditators--you create your reality!" I'm ripe for a Puget Sound recharge. Pleased to introduced Chan to Kathleen Norris. "Don't know when I've enjoyed an author's writing so much", Chan exclaimed, after initial skepticism. He even wrote a poem after reading the poems of Little Girls in Church! Good to have kindred souls at the Wok Inn Noodle to talk spiritual with! I'm ever grateful to have yoga in my life, to practice with and learn from other students (~ 6 classes/week). Back strength and hip balance slowly return as awareness wakes in my body. Feels like there's miles and miles to go. The longest journey begins with a single step; perhaps I'm more patient. With her excellent teaching skills and understanding of anatomy, the fitness club coordinator is filling the gap of not having a yoga teacher. My Boise yoga teacher Char, teaches the dance of death masterfully, as she continues to rotate from home to emergency room to nursing back to home, unable to hold classes. Sometimes she lectures me from her hospital bed, mascared eyes painted with shaky hands, hair piece akimbo, on my need to let go. So clearly we teach what we need. Thank you! December. After a couple of weeks of extremely restless sleep--hot tub no help--holiday stress erupted in shingles! Owwee! "It's the nerve thing", I said, showing blistery forehead and scalp to my nurse neighbors; they supplied the name. Body never lies. Sharp wake up call: too much on mind, too much sugar, too much, too much. Always humbling, pain; always a gift, healing. The potential pain of spending money on doctor and prescription for virus that runs course, returned me to prayer, faith and tea tree oil. God first. Finally escaped to Oregon for Solstice/Christmas. How welcome--Breitenbush cooks preparing healthy food, no phones, internet, letting go of endless lists. By now right eye nearly swollen shut. 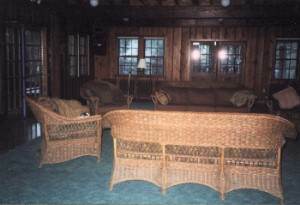 Curled up in cozy cabin, napped, tossed and turned; hot tubbed, read, rested. Usually spend energy trying to meet people; this time contentedly hid behind scabby, one eyed face, terrifying already nervous- about-strangers folks! Only one woman had the nerve to ask who won the fight. Slowly dived into the tantalizing pile of books selected for long awaited getaway! Sometime Idahoan Hays' Whale Island and Greenlaw's Lobster Chronicles delighted me; chortled and hooted by the hour. Nuala O'Faolain--awesomely sobering, brave. Good news is, we're finally telling it like it is. Only read one yoga magazines--boy am I behind! Blessed spiritual recharges at churches in Wilsonville and Seattle. I'm touched to the core by the tolerance, love, and positive message I observe and hear along "the coast". [Why ever are Idahoans so fearful?] Christmas dinner in Bellingham. Quick visits in Bremerton and Seattle. Never enough time, but then, who comes to Idaho, I remind myself. Do my best. Beautiful drive home, ending with fresh snow on the Blue Mountains. NO making sense of the year--largely survival, spaced by moments of delight. More books than usual, this, after I'd deciding I was losing interest in reading, had no more room in the brain (that's still true). Anne Lamott's Traveling Mercies. ; Cymbala's Fresh Wind, Fresh Fire; mostly "religious" writing. Books on tape: Ripley's Ridgerunner (Idaho history); Brook's novel of plague in England, Year of Wonders; Winchester's Map that Changed the World; Spink's bio of Mother Teresa. Speaking of wonders, discovered buying used books online. Another round of offering community ed classes--yoga, qigong, dance--and taking a few. Teaching 2 small yoga classes at home and 2-3 mornings classes at Boise's only family owned fitness club. Another year of agreeable Saturday morning meditations, yakking with coffee drinkers at informal sangha still known as Dharma Bums. Lots of meditation teachers coming through Boise on short notice, thanks to more buddhist groups than practitioners springing up! Another year of schizophrenic soul feeding, spiritual wresting --from Buddha to Jesus. Singing and learning at the Vineyard church, sometimes Calvary Chapel; laughing, socializing elsewhere, with Unitarians, Congregationalists, Idaho Buddhists. Twice the Vineyard minister's wife dropped into yoga at the fitness club. I hope/pray yoga will soon be taken off the Idaho evangelist list of satanic cults. Wish I were kidding. The list is long and "real"--one frightened woman referred me to Deuteronomy. Yoga helps her relax; bless her--she's caught between the devil and the deep blue sea. [Written by unknown men for unknown men, I thought to myself and shrugged.] It's almost as if folks believe the Bible says "Anything you don't like just call the work of the devil." [Too easy to blame my late night Blue Bunny shakes on a devil!] "Love thy neighbor as thyself", I always volley back. If I ever sense the hand of grace upon me, it's during yoga, when I reach for a positive phrase and my mouth is filled. I take this assualt on my sacred time (yoga) personally, until I recall Don Ruiz: "Take nothing personally". Bit of a drag how so many Idaho folks worship such a huge devil and believe folks (like me) aka "they" are doing the work of satan, when the "biggest sin" of all, is separation and division from the divine and each other! Yawn! I swear if I wore black wool cape that recently surfaced from the cedar chest, the sanctuary would empty out (or I'd be shot!) Still, the Vineyard minister continues to endears himself, sharing how he's convinced people are more afraid of the pain of relationship and each other than war. Right on, brother! He once referred to "agnostic Christians"--that's why I go to first service--before he wakes up fully. His passion for truth, empowering others, and training leaders is awesome. Too often I wonder where the loving God hides in Boise? End of summer Boise dedicated an Ann Frank Memorial by the downtown library (still only one library!) --hopeful sign of moving into the 20th century. So far, everyone I've met there's from out of state! Last summer had will drawn up. After years of having much of life in storage, feels urgent to get ducks in at least semi-order. Label family "heirlooms", get rid of stuff. Another year in Boise--perhaps not such a bad fit, what with all its independent drive- ins, as in burger and fries. Can always halt fantasies for a "real" hamburger for several months by stopping for burger at Big Jud's--never quite like they used to be at Secrist's in Jacksonville. (Thank goodness.) Or drive 20 miles to Nampa for an Arctic Circle shake, tho runner ups sometimes appear. Since I picked no blueberries this year, and another year slipped by without making homemade ice cream, perhaps 2003 will be The Year those two come together? Now that's a New Year's resolution I can embrace whole heartedly! Illini outing clubers get together after 30 years! 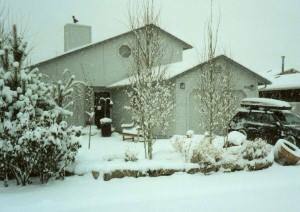 Old fashioned Idaho winter at Glencrest! deep rest... until the carpet's rolled back for wild dancing!